​So, Manchester United got banged out by Derby County on penalties in the Carabao Cup on Tuesday evening. Just when things seemed to be getting better for Jose Mourinho, his side managed to pull a special defeat out of the hat as Harry Wilson and Jack Marriot scored for the visitors, cancelling out Juan Mata's opener before Marouane Fellaini equalised in stoppage time. 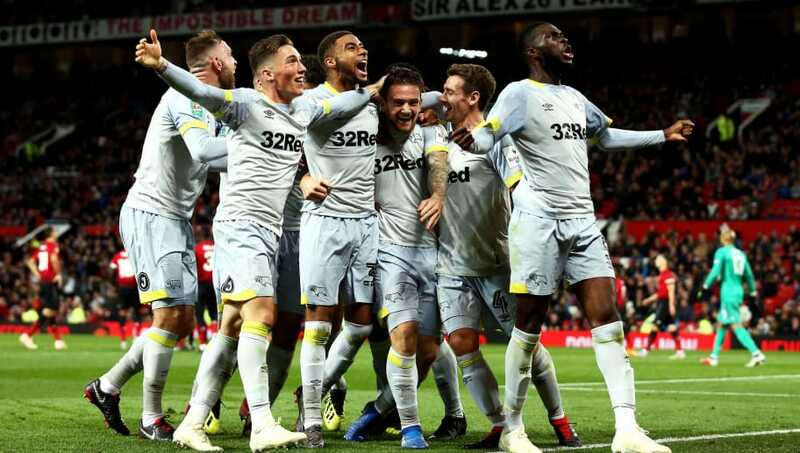 Somehow, Derby managed bounce back and beat their illustrious opponents on penalties as Phil Jones missed the decisive spot kick to give Frank Lampard's side the win. So where next for ​the Red Devils? How can they hope to recover from this embarrassing and hilarious defeat? Needless to say, Twitter had a few reactions. Pics of the Phil Jones face please! ​​There were plenty of shout outs to Harry Wilson, who scored an absolute barnstormer of a screamer to draw his side level in the second half. Jack Marriott then looked to have won it for the Championship club, only for Mourinho's go-to guy Marouane Fellaini to pop up late on with a trademark header. ​​Penalties eventually ensued and they were perfectly taken until Phil Jones stepped up. Needless to say, he missed, in true Phil Jones fashion, and Twitter was quick to tear the centre back to pieces. As soon as I saw Phil Jones walking up I knew it was over. It was always going to be Phil Jones. Always.